At Discovery Ranch we have designed a program that will help your son associate useful, productive success with technology. The Music and Technology Program will help your son learn how to see technology as a tool, not a toy. Your son will learn how to compose, record, and edit music. In addition, he will learn MIDI editing, mixing and automation, music notation, live instrument recording and more. But, don’t worry if this sounds overwhelming or difficult, it is not! The tools are easy to use. Many of our students begin recording music the first time they visit the studio. The best results require the best tools. 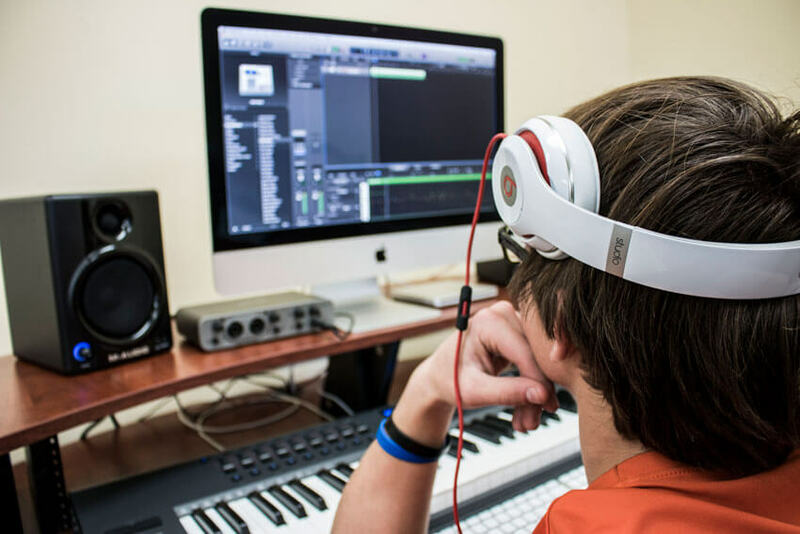 Our Music Technology Program utilizes the latest professional-level technology for music production. Specifically, the program uses Apple’s Logic Pro X software and the latest hardware. Our teachers will work hard to bring out the best in your son. They will coordinate with son’s therapist to help support his therapeutic goals. This has proven especially useful because music is a valuable means of self-expression. To clarify, our mission with this program is to provide experiences for our students where they can create new associations with technology. We do not expect your son to become a professional musician. The goal is help your son learn see technology as tool. Significantly, we also want your son to learn when to unplug. Pictured below is a couple of photos from our Annual “Battle of the Bands” competition where our program competes with other Residential Treatment programs to see who has the best band!